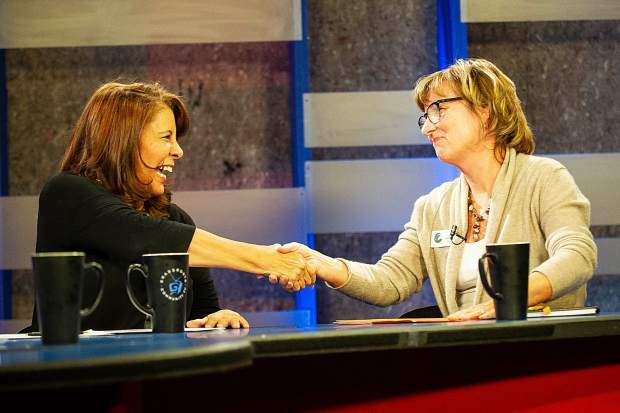 Eagle County Commissioner Jeanne McQueeney, right, shakes hands with challenger Jackie Cartier Thursday night at GrassRoots in Aspen for squirm night. Eagle County Commissioner Jeanne McQueeney on Thursday defended her vote to approve the controversial Tree Farm project in El Jebel last year by contending public opinion was split on the issue and that the board applied the “available” standards in the review. McQueeney, a Democrat, is seeking re-election from District 3, which includes the Roaring Fork Valley portion of Eagle County. The resident of Eagle is finishing a four-year term. Cartier, a Republican from Basalt, is challenging her. 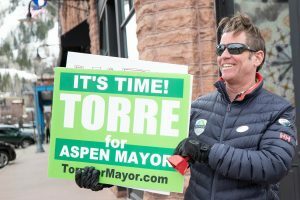 They debated Thursday in the Squirm Night forum in Aspen. Wyatt Orme, a reporter with Aspen Public Radio and moderator of the forum, asked McQueeney to explain her vote on the Tree Farm. He noted it faced widespread public opposition and that the town of Basalt and Pitkin County asked Eagle County to deny the proposal for as many as 340 residences and 134,500 square feet of commercial, which includes a hotel. “I hope that the people who came to the meetings saw that we were listening to the people that came, we were applying the standards that were available to us, we were using the master plan and the future land-use map as it was designed to interpret the proposal that was in front of us,” McQueeney said. “When we heard from the community and they said, ‘We want more of this’ or ‘We want less of this,’ we integrated that into the plan as best we could,” McQueeney continued. “It’s interesting that people say, ‘You didn’t listen to us.’ We didn’t follow everything, but it does feel a little bit like the plan changed based on the feedback. That means we were listening. 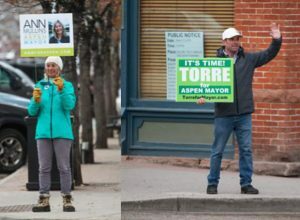 Cartier seized on the question to claim she could be a better representative of the Roaring Fork Valley, but she also defended Lane’s development proposal. 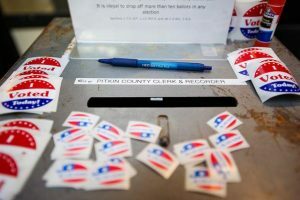 Cartier said Kathy Chandler-Henry is the Eagle County commissioner who spends the most time in the Basalt and El Jebel area and she “voted with the people in the Roaring Fork Valley.” The vote on the Tree Farm was 2-1, with McQueeney voting for approval with Jill Ryan and Chandler-Henry opposed. But Cartier made it clear she supported the Tree Farm. “Both sides agree that it is amazing,” she said. Orme challenged her on that assertion by noting there were a considerable number of people who spoke against the project and its impacts. It wasn’t clear if Cartier had attended any of the Tree Farm meetings in 2017, which were often contentious. The Tree Farm situation was similar to the controversy over the Willits Town Center project in Basalt, Cartier said. People opposed the Willits project during the review “but then liked it” once it was constructed. The Tree Farm has not been built yet. Cartier said the county commissioners could have held more meetings to try to build consensus and compromise on the Tree Farm. “When you’re looking at something this controversial, it’s important to get the two main people together,” Cartier said. She suggested she would have worked to get the developer and the “Basalt group” of opponents together to broker a deal and “hash out” issues such as traffic. She made it clear that some level of approval was justified. Over the course of the 30-minute debate, McQueeney said she is proud of what the county commissioners have accomplished over the past four years. 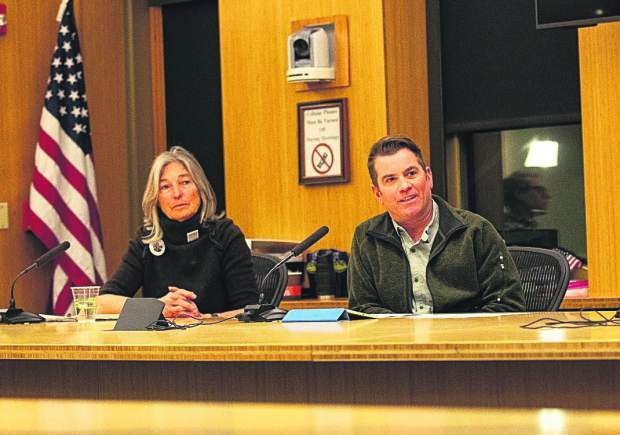 She said she does feel a connection with Roaring Fork Valley constituents and noted she serves on the Roaring Fork Transportation Authority Board and on a child care task force in the Roaring Fork Valley. She said she wants to be re-elected to work on issues such as child care, transit and affordable housing. Cartier focused on better representation for the Basalt and El Jebel area in Eagle County government. 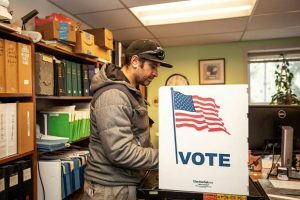 “They aren’t getting the representation they need; maybe they are but they just aren’t feeling it,” she said. She also touted growing the economy to provide more opportunities for young people — both good-paying jobs and housing. Cartier said she is against the government building housing. She wants to build a new generation of entrepreneurs who can afford to buy free-market housing. “My generation needs to go away. They’re dying off,” Cartier said.